The federal government shutdown and impending debt ceiling “deadline” have led to near panic over possible default on the national debt. This imagined “default crisis” is a canard used for demagogic fearmongering. That said, the long-term federal financial issues are all too serious. If federal officials simply continue on with their current financial plans, the U.S. government could run into trouble in early November. Without a debt ceiling increase, the Treasury would be unable to meet some of its financial obligations. Treasury bills would take a hit in international markets. With T-bills losing value in markets, interest rates—especially short-term interest rates—would start to rise. Rising interest rates would impair recovery from the 2008 financial crisis. The assertion that a debt crisis would impair an already weak economic recovery is correct. However, any claim that the federal government is up against a hard deadline to meet its legal financial obligations is utterly untrue. The federal government holds vast amounts of property, all of which is available to be sold off. How much is needed to cover federal interest payments? Interest rates are, for the moment, very low. Accordingly, interest payments on the debt are a small percentage of the total federal budget, despite the large size of the national debt. With annual interest payments at a couple of hundred billion dollars, there is no impending debt-ceiling default crisis. 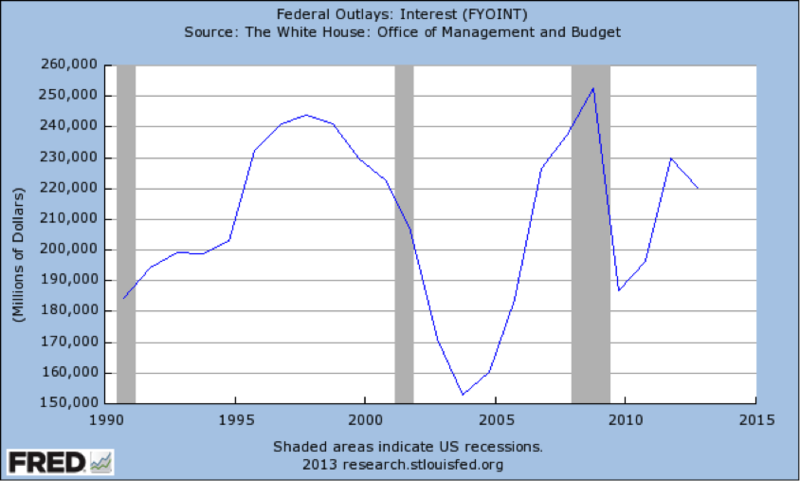 How exactly could the federal government pay interest on the national debt? 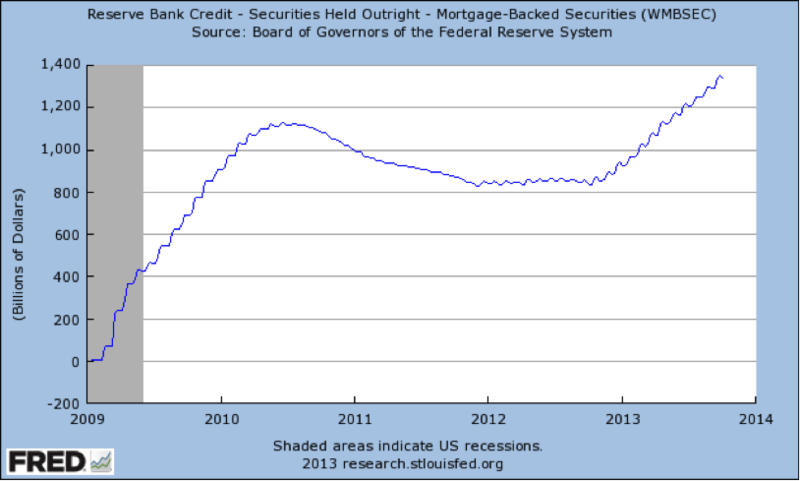 To start with, the Federal Reserve now holds large numbers of mortgage-backed securities. There is some uncertainty over the market value of these securities, but their face value is immense, well over one trillion dollars. Sales of some of the better quality mortgage-backed securities could fund interest payments in the short term. 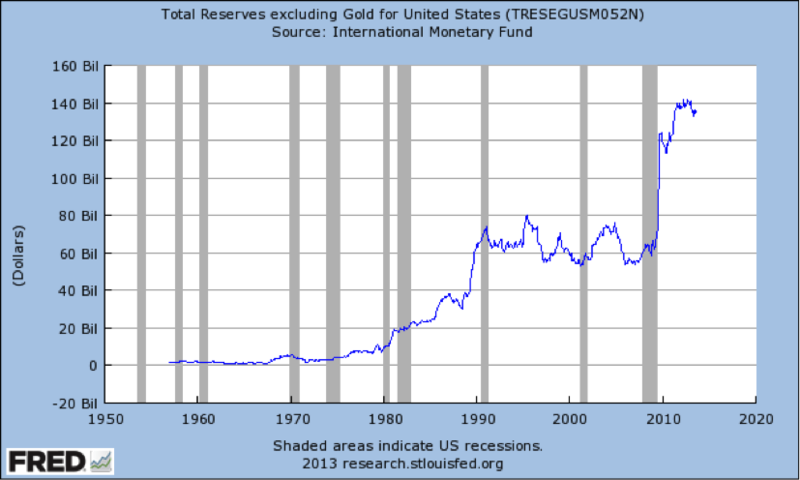 U.S. gold reserves are also substantial. The U.S. holds thousands of tons of gold at Fort Knox and at the New York Federal Reserve. Sales of a small part of U.S. gold reserves could be used to make immediate interest payments. The U.S. government also holds large amounts of idle real estate. The federal government spends $8 billion on vacant buildings annually. That’s for an estimated total of 55,000 to 77,000 buildings. The fact that our federal officials aren’t sure how many buildings they manage is itself disturbing, and a sign of incompetence. However, it seems that there are at least over 50,000 such buildings. How many hours would it take for federal employees who “manage” these buildings to post some of them on eBay? Surely sales of these properties would raise enough money to cover federal interest for about a month or two of the next year, even if each of these buildings sold for only a half a million dollars on average. The President has already acted in arbitrary—and some would say illegal—ways: by granting special exemptions from the Affordable Care Act to favored corporations, by using drones to kill U.S. citizens, and by targeting unfriendly political groups for audits. If Obama really wants save his beloved federal government from default, why shouldn’t he just use the extraordinary powers that he has already claimed to order the immediate sale of vacant buildings? The point here is not to encourage further illegality on the part of this President (he needs no assistance in such matters). The point here is that Obama does not have his back against a wall; there is no “gun to his head.” Obama has already claimed more than enough discretionary powers to prevent a debt-ceiling default in November. If default does happen it is entirely his choice, given that he has legal options and has already assumed various unconstitutional powers. The federal government holds over 700 million barrels of oil in the Strategic Petroleum Reserve. Obama could raise billions of dollars for interest payments without selling the whole reserve. Some people might see sales of the SPR as irresponsible. However, the oil in this reserve is a small fraction of monthly oil consumption, U.S. oil production is rising, and owners of foreign oil have overwhelming financial interests in continued oil sales to the United States. The federal government also holds a Strategic Helium Reserve. It was created for “national security,” for blimps used by the military leading up to and during World War II. This program is archaic and the government already sells some helium. It could sell all of it and shut this program down. Default on the debt is always possible. Obama and his people at the Treasury Department could have refused to pay interest on the national debt last month even though they had this money at hand. They could choose to default next month even though they can get the money—either through legal means or according to Obama’s demonstrated willingness to act illegally. The sale of federal assets and closing of federal programs would do more than just meet short-term interest payments on the national debt. 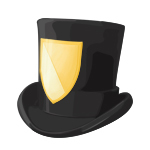 Movement of securities, gold, buildings, oil, and helium would put these resources in the hands of people who would not merely put these resources to better use, but to actual use. The leeway that exists in federal finances points to longer-term financial and economic problems. Why would Obama engage in fearmongering on the national debt when obvious solutions to this problem exist? For that matter, why would federal officials hold so many idle resources for so long? The reason why the federal government runs deficits nearly every year, despite collecting trillions in annual taxes, is because it wastes vast amounts of money on dysfunctional programs and special-interest payoffs. An efficient government would not need to tax and borrow nearly as much as does the federal government. The gross inefficiency of government has put federal finances in long-term jeopardy. The real debt ceiling is determined by the ability of all working Americans to pay more taxes. How much more can we pay? Continued structural deficits and rising entitlement spending will result in default on the national debt, but not for a number of years. The existing path of long-term federal spending does surpass the capacity of taxpayers to fund the federal government, as it is currently designed. Future default on the national debt will have severe consequences. However, Obama’s willingness to engage in demagoguery on the immediate debt-ceiling issue is one of many signs that politicians are unwilling to take necessary steps to fix long-term fiscal finances. The legal debt-ceiling crisis of 2013 is manufactured and phony. Even if Congress refuses to raise the legal debt ceiling this year, there are many ways of avoiding immediate default. The real problem we face is wasteful and irresponsible spending that will make default unavoidable eventually. Long-run default is, of course, avoidable. What we need are real cuts in federal spending, actual sales of federal assets and properties, and rationality in federal finances. Cutting spending and selling assets are easier said than done. Achieving smaller government will require a dramatic shift in public opinion. Americans need to realize that politicians who try to scare us are the ones that we really should fear. D. W. MacKenzie is an assistant professor of economics at Carroll College in Helena, Montana.